Magnum Research's Desert Eagle gets a Picatinny rail on its 25th anniversary. If you had to take inventory of the most popular handguns unmistakably recognized throughout the world, the Magnum Research International Desert Eagle would have to sit near the top of that list. In large part, its immense popularity can be credited to its numerous starring roles in Hollywood movies and video games. Its large size, intimidating appearance and big-bore chamberings have helped the Desert Eagle retain street rights to its nickname, King of Pistols. To get the history on this iconic pistol, I spoke with Magnum Research's president, Todd Seyfert. "Remember watching the Dirty Harry movies back in the '70s?" Seyfert asked. "That line in the movie that described the most powerful handgun in the world? Basically, Bernie White said, 'Why can't someone figure out how to put a .357 Magnum in a semiautomatic?'" White, one of the founders of Magnum Research, had approached many companies with the same challenge and was told that it couldn't be done. That was until he met with Israeli Military Industries (IMI) in 1979. It took three years after the design process began in 1980 to completely develop the Mark I, which was originally patented by White in January 1983. Once IMI refined the design for production, a second patent was filed in December 1985. Although Magnum Research's recent 25th anniversary celebrates the date that Desert Eagles were commercialized, the company is really 30 years old. Over the last quarter-century, there have been just three variants of the Desert Eagle. The Mark I sported a 10-inch barrel and was offered in either a steel, stainless or aluminum frame. The Mark VII was the Mark I's successor and introduced an adjustable trigger that could be installed on the Mark I. Both were available in .357 Magnum and .44 Magnum, but the Mark VII added the .41 Magnum to the family tree, as well as an optional 14-inch barrel. The Mark XIX (spoken "mark 19") was a continuation of the Mark VII with an integral Weaver scope rail on the barrel. The .50 AE became a popular option in this model, while different finishes (chrome, gold and titanium) sought to satisfy the custom tastes of other handgunners. Barrel lengths in the Mark XIX were limited to six and 10 inches. The first time I handled a Desert Eagle goes back to just before Operation Desert Storm. A close friend of the family and local sheriff's deputy brought one to a range day. I can remember marveling at its tough appearance and unique operation. When firing it off the bench with some unusually hot loads, I jokingly wondered if it could second as a flamethrower on a battlefield. That deputy was a Marine reservist and deployed with his unit to the Persian Gulf. He returned a year later to a hero's town welcome and talked about a new Desert Eagle he had read of while in Saudi Arabia, one that was going to be chambered in a .50 caliber cartridge. IMI's civilian arms production was suspended for the war in 1991, and handgunners had to wait a year before finding one. When it did show up, the Desert Eagle earned bragging rights as the first production .50 caliber handgun, and the desert war veteran traded up. I'm still certain that he was just trying to stir my envy. The new Hogue rubber grip panels help the gun shoot more comfortably, and the newly redesigned safety is ambidextrous. The Desert Eagle is a unique gas-operated semiauto, a type of operating system that's more commonly aligned with modern tactical rifles. Also unusual when compared to other semiautomatic pistols is the polygonal-rifled barrel; it doesn't move during the cycle of operation. Polygonal rifling doesn't have sharp edges on the lands of the bore that gradually wear in during use, and it's reputed to extend the accuracy and effective service life of barrels on HK and Glock pistols. Once a fired bullet passes a port near the breech, gases take the path of least resistance and travel forward through a small tube under the barrel. At the end of that tube is a cylinder. A piston is fixed at the front of the slide assembly and rests within this cylinder. The expanding gases go through the tube and into the cylinder, slamming into the piston and pushing the slide assembly rearward. The slide assembly (also considered the bolt carrier) runs along rails on the side of the barrel and pulls back on a rotating bolt. With the bolt rotated and unlocked, the extractor draws out the spent case and immediately ejects it after clearing the chamber--courtesy of a spring-loaded ejector. Caliber conversion is straightforward and requires only a correct barrel, bolt assembly and magazine. One small note to those thinking about converting their .44 Magnum or .50 Action Express Desert Eagles: The size of the .44 Magnum's rim is the same as the .50 AE, so only a barrel and magazine are necessary to switch between the two calibers. In my opinion, the big news is that Magnum Research has tooled up CNC machines to manufacture Desert Eagles here in the U.S. The company can now control quality, which plagued the Desert Eagle's reputation at times. "Basically, we sat down and said, 'We don't want to change the good things, but we want to blend the feedback of our customers,'â€‰" said Seyfert. "Manufacturing the pistol here, we can remedy inconsistencies in the gas system. We were never able to check the gas system because it was already on the gun. The problem is that if gas leaks and a shooter has a bad grip, you can get misfeeds. That was the No. 1 comment from our customers. Now we can test and guarantee that the gas system works properly before it ships." Having obtained the new Desert Eagle, there's one noticeable change to the Mark XIX that you can't miss. Original Desert Eagle barrels had a 3/8-inch dovetail to attach a scope mount. Mark VII pistols changed this feature to a machined 7/8-inch Weaver rail (carried over to the Mark XIX) that allows the shooter to directly attach rings and an optic. The newest development is also the most visible difference between the new and old models. Now a Picatinny rail runs from the chamber area to the front sight, affording more real estate to crown this king with a wider selection of contemporary optics. look closer at the new pistol, it also features a number of other enhancements. The Mark XIX now features an ambidextrous safety that's been reshaped for ergonomics. Magnum Research took weight out of the slide, tightened up the action and toughened up the appearance. 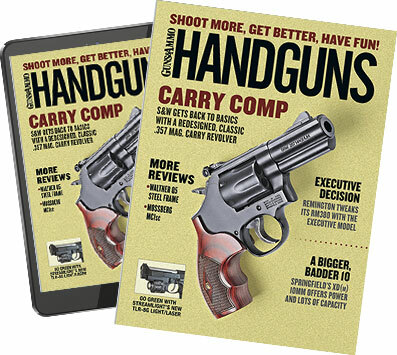 The firm also teamed up with Hogue Grips to help to make the pistol more comfortable to shoot. The Mark XIX carries a set of rubber Hogue grip panels that can be adapted to earlier models. The Desert Eagle's gas-operated, rotating bolt system is more like what you'd find on a tactical rifle. The slide functions as the bolt carrier. "We wanted to keep them the same so people could interchange components with the older Desert Eagles," Seyfert said. "We wanted people to build upon their collection, not start over." What you'll see on the 2010 models (ours is a 2009) is a muzzle brake that takes felt recoil of a .50 AE to that of a .44 Magnum. The best part is that Magnum Research will retrofit any older Desert Eagle for it. "We never had a muzzle brake before, but many customers had asked for it. Now all you have to do is send us your old one for an upgrade," Seyfert said. "We have had no issues and no degradation in accuracy by adding the muzzle brake." I'm usually interested in the practical accuracy of guns I test rather than potential accuracy, so instead of bolting the Mark XIX into a machine rest and saddling it with some big optic, I mounted a Trijicon RMR reflex red-dot sight and fired it off a sandbag rest. Part of my reasoning for choosing a red dot sight was that the Mark XIX already weighs four pounds, so why would I want to add significantly to that? And when you're holding the Desert Eagle, you don't want to spend a lot of time searching for the dot or the target, so a low-profile optic that doesn't inhibit one's field of view is an advantage. Shooting round after round of 300- and 350-grain bullets that travel between 1,300 and 1,500 fps is no picnic, especially if there's a struggle to sight it in. Fortunately, the RMR pointed the barrel where it needed to be, and it took just four shots to get the Desert Eagle zeroed at 25 yards. Evan Whildin developed the .50 Action Express in 1988 specifically for the Desert Eagle. It's a very powerful cartridge (as much as 40 to 50 percent more energy than a .44 Magnum) that's initially controllable but can eventually wear out your wrist. Limp wristing is unforgivable, and the Desert Eagle punishes a weak grip without remorse. The weight and rubber grips of the Desert Eagle are effective in managing recoil, but you still feel the power. Because I had to place five five-shot groups of three heavy loads on paper for accuracy, I enlisted the help of Payton Miller, executive editor of Guns & Ammo, who ran the same ammo across a Pro Chrony chronograph to come up with the velocity data. After all that work, the numbers were solid. Hornady's 300-grain JHP produced the slowest average velocity but was the most consistent load. Accuracy never grew near two inches (which is incredible for a cartridge of this diameter), and my best group at 25 yards measured 1.5 inches. Magnum Research's own 300-grain load features a Speer Gold Dot hollowpoint shoved into the case mouth. It's a wickedly effective bullet with a proven reputation among law enforcement, and the Magnum Research load pushes that bullet at more than 1,500 fps nearly every time. It produced the best group of the test, measuring 13/8 inches. Before leaving the range that day, I evaluated the Desert Eagle at 100 yards, the maximum range I would attempt to take a shot with this setup. My group sizes averaged 4.32 inches with the Magnum Research 300-grain Gold Dot. Some would call this minute-of-deer. The new Picatinny rail offers more real estate for mounting optics such as this Trijicon RMR. Just be sure they're fastened securely due to the gun's hefty recoil. "The Desert Eagle was always inherently accurate," said Seyfert. "The CNC machines we're now using here in the U.S. help to make the gun's fit and function tighter than ever before." Payton and I fired more than 200 rounds through the new Desert Eagle in .50 AE. After firing nearly 100 rounds, the accuracy dropped off completely as the Trijicon RMR couldn't continue to ride the bucking pistol tightly (if only I had put Loctite on the threads). This issue was foreshadowed by a visit to one of the many Internet forums dedicated to Desert Eagle enthusiasts. Many noted that after firing anywhere between 40 and 100 rounds, optics had to be secured and rezeroed. The RMR was unharmed, but I decided to remove the reflex sight. I completed the reliability test by firing the remaining ammunition in controlled rapid fire using the factory three-dot iron sights. We had only three malfunctions (two failures to eject, one failure to fire), and those were with a load that we probably shouldn't have included: Samson 300-grain JSP. It was older and more inconsistent across the clock, but we tried this load because readers could still run across it at gun stores and gun shows. Using quality factory ammunition and with correct handling, this latest Desert Eagle in .50 AE should deliver excellent performance and flawless reliability. In my opinion, no handgun collection is complete without the King of Pistols. For many of us, a memory produced by an over-the-top experience like this one is how we got interested in shooting in the first place. I didn't have a great need to buy a Desert Eagle. I'm not going to carry one for self-defense, and I'll have limited opportunities to hunt with a semiauto handgun (although you can hunt with it in many places). Fortunately, the mystique of owning one and the enjoyment of shooting the .50 AE is enough to justify my purchase. As intimidating as it may first appear, anyone who simply holds the Desert Eagle can't help but grin and take a moment to imagine what it would be like to shoot it. It's one of those guns for which people whip out their cell phone cameras just to get that opportunistic photograph. Sometimes, you don't really need a better reason than that. Like your guns with a bit more pizzazz? Desert Eagles, which are now made in the States, also come in gold, chrome and other finishes.